While writing your show to the SD card for an MP3 player, the Hardware Utility will automatically monitor how much bandwidth is required by your sequence every centi-second. When the bandwidth is exceeded, the program can 'compress' your data so that your music and lights stay better in sync. The advanced options window allows you to turn this functionality on/off or adjust its parameters. Please note that changing these parameters can cause your show to fall out of sync, have unacceptable delays, or cause other issues. You should only change these if you are having issues with the defaults, and even then be prepared to restore to the defaults should your show fail. For 99.9% of shows, these defaults are already optimized. •Throttle Data Output for Improved Performance: It is recommended that this option remain ON (checked). When checked, your sequence is monitored. For each centi-second that passes, the program will compute the amount of bandwidth required and compare it to the amount available. If unchecked, no throttling is done - this is the same mode as versions previous to 3.12.0. •Minimum Throttle Time in CS: If throttling is enabled, this is the minimum amount that the sequence must be behind before compression starts. For example, if this is set to 5 CS, then once the sequence is 5 or more centi-seconds behind the audio, compression will begin. Setting this higher will allow for more complex areas of your sequence to remain uncompressed at the expense of lagging further behind your audio. The default value is 1, and this means that as soon as the sequence falls behind, compression should begin. 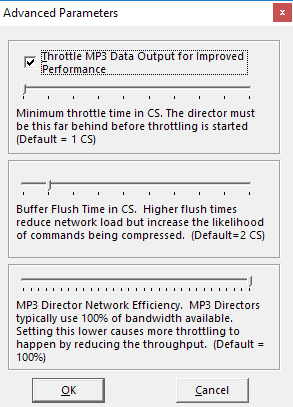 •Buffer Flush Time in CS: This can be thought of as the 'resolution' that your MP3 Director will run at. Setting the value lower will increase resolution as well as network load. Setting the value higher will decrease network load at the expense of having more commands be compressed. The default value of 2 most closely emulates what a computer produces for output, either in the Sequence Editor or the Show Player, when running a sequence on your hardware. For versions before 3.12.0, this value was 1. •MP3 Director Network Efficiency: MP3 directors will typically use 100% of the bandwidth that is available for a port. Setting this to a lower percentage reduces the amount of throughput, which will cause more throttling to happen. It may be best to think of this option as a reduction in the network speed. For example, if you set a port to 57.6K speed, and set this option to 70%, then the hardware utility will throttle the sequence as if it was for a network that runs at approximately 40.3K (57.6 * 70%).